BUSAN, South Korea--(BUSINESS WIRE)--Global Game Exhibition "G-STAR 2016" which was attended by 653 vendors (2,719 booths) from 35 countries around the world, recently ended with a great success achieving the best results ever in its history in both public and business areas. "G-STAR 2016" organized by the Korea Internet Digital Entertainment Association (K-iDEA) and managed by the G-STAR Organizing Committee and the Busan IT Industry Promotion Agency was held at Busan, BEXCO for four days from November 17 (Thursday) until November 20 (Sunday). This year marked the 12th "G-STAR" exhibition which showcased various entertainment exhibitions encompassing the exhibit space of approximately 55,300 square meters. In particular, this year's "G-STAR 2016" was headed by a slogan of "Play To The Next Step" which presented many possibilities of forecasting the future of the game industry. In addition, as a comprehensive game show that covers all platforms from online to mobile and to console, "G-STAR 2016" drew passionate responses from the visitors who visited the venue throughout the event period. The Business Area located at exhibition centerⅡof BEXCO confirmed its position as the best game business exhibition in Asia. 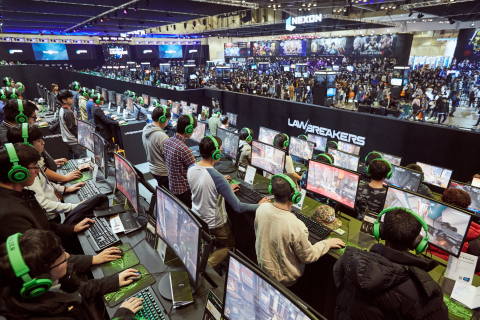 Particularly, paid trade visitors recorded 1,902 registrations which was an increase of 6.8% from 2015 which had 1,781 registrations, resulting in lively game business consultations. Mr. Kwanho Choi, Chairman of G-STAR organizing Committee said, "With active participation by users who love to play games and game corporations, this year's 'G-STAR 2016' was able to produce positive results again," and added: "We, at 'G-STAR', will continue to work hard to develop various new contents and strive to maintain our status as a global game exhibition."